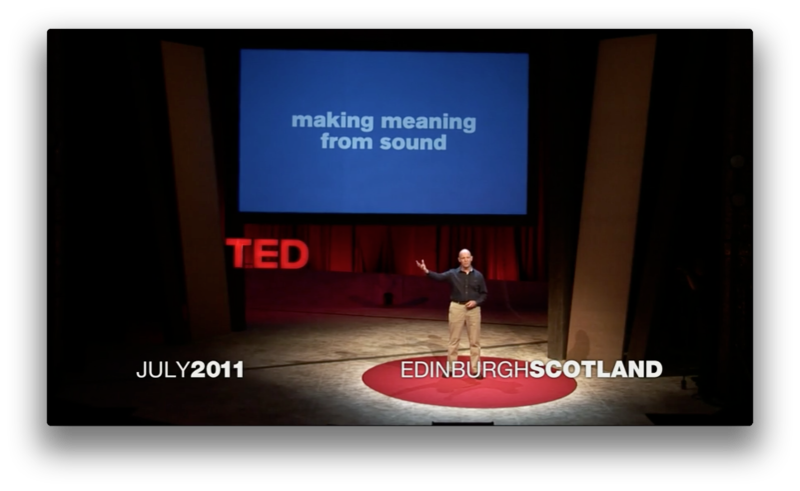 This recent TED Talk by Julian Treasure on 5 ways to listen better is a fabulous example of an effective presentation. Watch it, then let's talk about what you can do to improve your presentations. This talk is only 7 minutes long. As Julian explains, with our busy world, our attention spans are shrinking. We pay attention to fewer things for shorter periods of time. Keeping a presentation short helps ensure that the audience doesn't reach the point of being antsy and bored. But what if you're teaching an hour long class or have to give a presentation that is longer than 10 minutes? Break it down into smaller segments. As Dr. John Medina explains in Brain Rules, students tend to tune out at around the 10 minute mark, so structure your lesson to take advantage of that. Divide the lesson or presentation into 10 minute chunks, create your slides around those segments, and build in a break or related activity in between each of them. This helps regain the attention of the students. Even a simple joke can work – as long as it is directly related to the topic. Breaking down the lesson into smaller chunks also makes it easier to prepare. When you watch the video, notice how there is no self-introduction, incidental anecdote about his plane ride, an lengthy list of thank you's, or a string of "umms" and throat clearing noises. He simply starts by stating the thesis of his talk, "We are losing our listening," which he promptly backs up with a clear set of data. This is the art of the cold start, which I have mentioned before. All of that warming up tends to bore the audience to sleep, while a brisk opening wakes them up and let's them know you mean business. It's a theme that I repeat over and over again. Your slides are too complex. Everyone tries to cram too much information on a screen which is not meant for detail. Slides accompany your talk, they do not deliver it. Julian's slides are dead simple. No bullet points, no title and body text. Just simple phrases in large text on a decent colored background. They accompany his talk and reinforce the message he is trying to share. We've all seen it: the presenter pacing awkwardly around the stage, more often than not in a little jazz square near the lectern, pausing periodically with one leg crossed in front of the other. I like to call it the "presenter potty pace," and it happens when we are unsure of how to stand and what to do with our arms. Standing comfortably takes practice and awareness. Julian demonstrates it perfectly at 6 minutes 40 seconds into the video when he suggests that we be "connected in space and in time to the physical world around us, connected in understanding to each other." This also explains why nervous presenters look uncomfortable in their own skin – they lose connection with the present moment. Their minds are racing thinking about themselves and what they're supposed to say, and whether the presenter remote is working. If they just calm their minds, acknowledge where they are, and focus on their audience, they can relax into their stance and present comfortably and naturally. Julian is so adept at this, that, for a moment, he even had the confidence to dance a waltz on stage! Learn to stand comfortably while on stage. The TED stage has a large circle of red carpet which, I assume, is meant as a boundary for the presenter. There are likely many reasons for this, such as making it easier for stage lighting and the camera crew, but it also benefits the presenter. If they are conscious of the boundary, they will not wander frantically around the stage. Having a soft limit gives you a safe area to move around in. Just like Julian does, it is ok to shift your weight, take a step or two, and move your arms deliberately. Oftentimes, I will script a stage move at a specific point in my presentation, i.e. walk across the stage while introducing the second topic, stay there, then walk back while introducing the third topic. In general, though, stand with your feet about shoulder width apart and your hands relaxed at your side or in front of you if you tend to gesture a lot. Of course, for teachers, it may be a little different. It is important to move around the classroom and maintain a close connection with the students, especially in K-12 (although, if you're using PowerPoint in grade school, we need to have another discussion). But when you are moving among the audience, it is even more important to maintain that relaxed confidence and presence of mind. 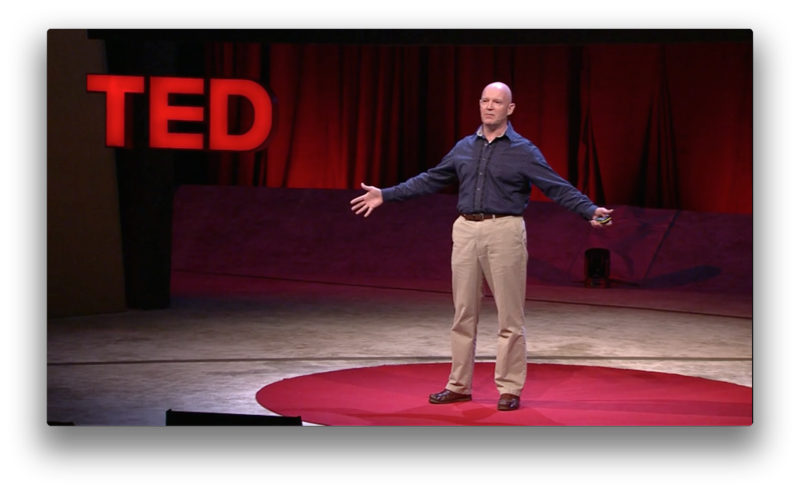 What other presentation tips can you learn from this wonderful TED Talk? Last week, Steve Jobs gave another opening keynote at Apple's World Wide Developer's Conference in San Francisco. As always, it was a prime example of great presentation skill. As he shared the stage with a number of other presenters, the amount of preparation was evident. The presentation lasted nearly 2 hours and flowed smoothly, no doubt due to a lot of rehearsal. The slides were very well designed and showed constraint in the information that was included on each slide. You can see the entire presentation here: WWDC 2011 Keynote. In this post, however, I would like to draw attention to a different presentation in a different venue later that week. Steve Jobs presented to the Cupertino City Council to share design plans for a future Apple campus to be built by 2015. While this presentation was no doubt important, it doesn't compare to the larger announcements Apple makes which have a much greater visibility in the media. Nevertheless, the same amount of preparation was very evident in this more informal presentation. Steve had a plan and an outline for his remarks, and spent time designing effective slides to act as visual aids. I would like to point out one particular example of this. In the video below, which starts about 4 minutes into the presentation, you see Steve direct the attention of the council to his slides for the first time. As he explains the current properties owned by Apple and the current buildings, he shows an aerial view with the areas mentioned highlighted with a green overlay. Those areas then change to show the new buildings that are proposed and the overlays fade away leaving everything but the new campus desaturated. It was a very effective technique to draw the viewers attention to the particular areas of interest. In an effort to be overly helpful, the council chairman tells Steve: "You can actually draw on the screen, that's how high tech we are." "I don't really need to draw on the screen, you can see it clearly." Steve knew that his slides were well designed with the viewer in mind. Rather than using a tiny laser pointer flashing across the screen, or even the high-tech ability to scribble all over the slide, Steve planned ahead and used some simple image editing to highlight the areas. In the classroom, I understand the occasional need to draw on a diagram or add underlines when going over information (students always ask convoluted questions which are difficult to prepare and plan for). But, in general, lecture slides are used over and over each term in multiple sections of a course to introduce the same material, so pulling focus should be built into the slide design with simple highlights and smooth transitions. From a backyard studio in sunny San Diego, Mike & Nathan discuss how you can begin thinking like a designer in a shorter episode.